Design Bar Collection or Custom Designs Which is the best fit for you? Not sure which direction you want to go? Here’s the breakdown on each option. We’re confident one of these will fit you perfectly! Our Design Bar Collection is an affordable, fully customizable set of invitation templates that offer quick turn-around times. Our Custom design option lets you work closely with our experts to create an invitation suite that is designed specifically for you from scratch. Check out the details of each option below. Design Bar options offer the quickest turnaround time (4-6 weeks from concept to final delivery). We’ll send you the first digital proof of your invitation suite within 3-5 business days after receiving your deposit and wording details, and we’ll go to print after receiving your final approval on the design. It takes 10-15 business days (2-3 weeks) for printing to be completed. For bespoke invitations, the turn-around time from concept to delivery can take anywhere between 7-10 weeks. Your initial design will take about two weeks to create. From there, we’ll work together on revisions until you’re completely thrilled with the final result. Once everything is approved, we’ll move into the actual printing process. This phase will typically take anywhere between 15-20 business days (3-4 weeks), depending on the intricacy of your final design. Feel free to personalize any of our designs to fit your wedding style. Switch up ink colors, fonts, print methods, paper weight, paper size, envelopes, liners and even combine elements from multiple designs to create something really unique. From monograms to custom maps, you have the freedom to personalize your invitation suite any way you want! We’ll create your bespoke design based on your story and tailored to your specific wants and needs. From creating an impactful first impression with your envelopes to developing a cohesive design that ties all pf your paper goods together, we’ll walk you through every step of the process with professionalism and expertise. Want an even higher level of personalization? We’ll create one-of-a-kind hand-drawn and watercolor elements that will make your invitation suite truly unforgettable! Each invitation is printed on luxurious cotton paper stock. You can choose from our standard one-ply paper weight or upgrade to a thicker two-ply option, and you can select colored paper & envelopes, as well. 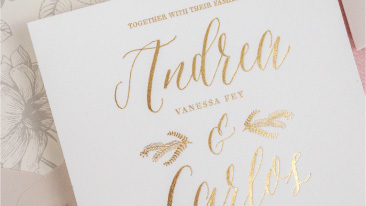 In addition to our standard stock of luxurious cotton papers, we have a wide variety of uniquely-textured papers and hand-crafted artistic elements that give you even more options for creating bespoke invitations. We offer three printing options to suite every style and budget: letterpress, foil stamp, and digital print. We’ll walk you through each option and help you decide which one is right for you. Our custom designs can incorporate a variety of production methods, including letterpress, foil stamping, digital printing, embossing, and laser cutting. We’ll walk you through the options and help you decide which one is perfect for you. 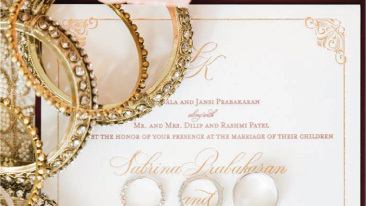 Add some beautiful accessories to take your invitation suite to the next level! Get creative with wax seals, silk ribbons, bellybands, pocket folds, calligraphy, custom postage and much more! Check out our Accessories page for more ideas. Accessories take your invitation suite to the next level. Laser cut pockets, custom foiled pockets, textured lace elements, silk ribbons, transparent vellum overlays, wax seals, hand calligraphy…the list goes on! If you can dream it, we can create it. We start working on your design as soon as you fill out your order form and share all of your wording & wedding details with us. We’ll send you mockups of your invitation suite within 3-5 business days. We’ll guide you through the design process, pulling all of your elements together for a cohesive and beautiful look. We’ll also help you select the perfect ink & font options that fit your wedding style and advise you on all the best practices for wedding etiquette. After receiving your initial inquiry, we’ll begin the conversation via email and set up a phone or in-studio consultation to learn more about you, your love story, and the specific details of your big day. All of this will help us guide you in creating the perfect invitations that truly reflect your unique style, personality, and vision for your wedding. The cost for Design Bar invitation varies based on the print method you select and the quantity you require. For letterpress, the typical invitation suite* begins at $580. For foil stamping, the typical invitation suite* begins at $980. For digital printing, the typical invitation suite* begins at $425. Once we have a clear vision of what you are looking for, we’ll provide you with a detailed, à la carte quote. This will allow you to see what each item costs and allow you to select your favorite items that work best within your budget. Whether you decide to personalize an invitation from our Design Bar Collection or create a Custom Design, we’ll guide you along to make sure you are staying within your desired budget.